"I love greens, garlic, and lemon! This blends all three for an awesome-tasting side dish." Separate the stems of the chard from the leaves. Cut the leaves into thin strips and set aside. Thinly slice the stems. Heat the olive oil in a large skillet or pot over medium heat. Stir in the sliced garlic, red pepper flakes, and chard stems, and cook for 3 minutes until the flavor of the garlic mellows and the stems begin to soften. Stir in the shredded chard leaves, cover, and cook 5 minutes over medium-low heat. 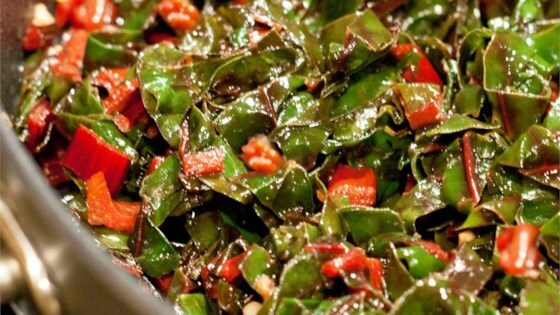 Stir, recover, and continue cooking until the chard is tender. Toss with lemon juice to serve. First attempt cooking chard and it was really yummy! Only gave it four stars as I didn't have red pepper flakes so can't say I followed the recipe to a "t". Great as is though! I tried & cooked chard for the first time & it was delicious. I'll make it again, maybe adding pine nuts. My family (husband and 7 yr old son) loved this. I added zest from half the lemon the last minute of sauteeing the stems. We like our food lemony. Delicious and simple! We also leave the red pepper flakes out and cook the chard in 1/4 cup of chicken stock, drizzling the oil and lemon on afterward. We add salt too! Added some Bok Choy into the mix and it turned our fantastic!